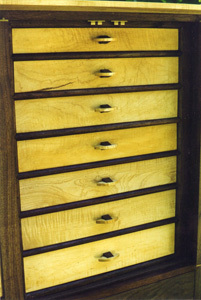 Double doors with single shelf and 4 storage drawers make this a useful piece for a variety of applications. 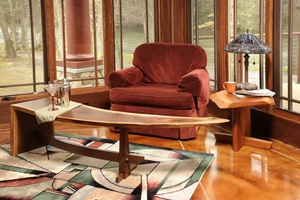 This trestle base allows more leg room around the vertical support. 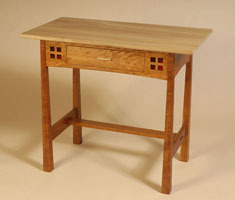 As with all my tables you are welcome to choose your top and base material. 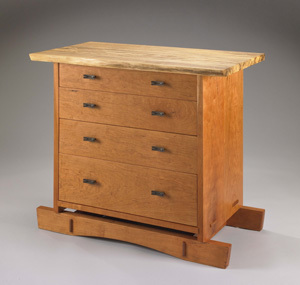 Contemporary look with Arts and Crafts roots this table features an open apron with accents of contrasting wood. 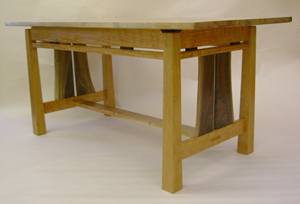 Table can be made with a natural edge top or conventional top. 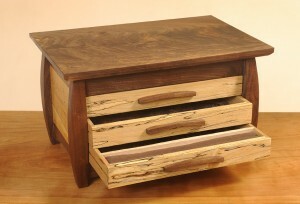 You can choose to use contrasting wood or use one species throughout. 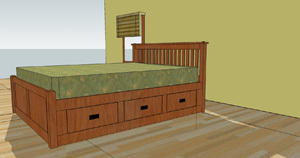 6 Drawers of storage in a mission style bed. 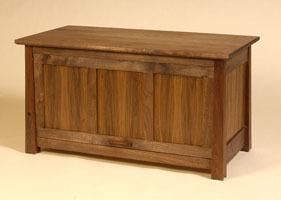 Great for maximizing your storage in a small room. 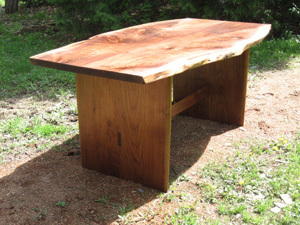 A curved natural edge slab of walnut created the opportunity for this design. 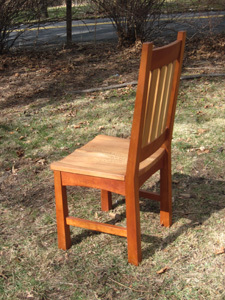 The base features a waterfal leg on one end and single upright on the other. 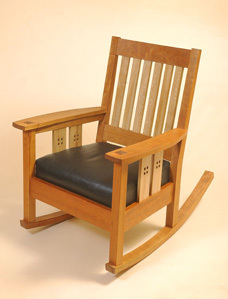 Joining the two is a curved laminated stretcher. 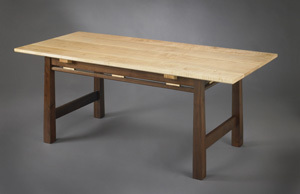 In the background you will also see a cherry sagaku table . 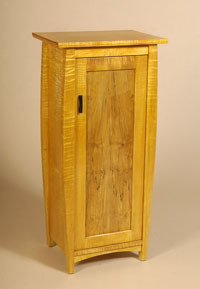 Custom Black Cherry and elm cabinet with two sliding doors. 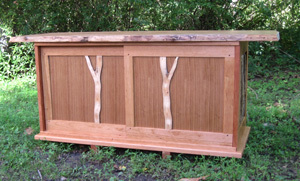 Sawn twig stile in doors and stick slats in sides for air circulation. 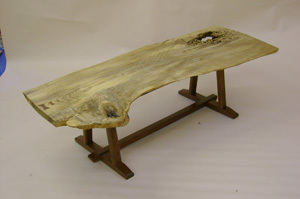 The beauty and shape of individual trees bring an organic feel and natural elegance to each piece. 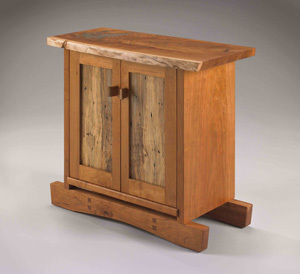 With a storage area and open shelving these cabinets serve as both a practical piece of furniture and a display unit for treasured pottery or other possessions. 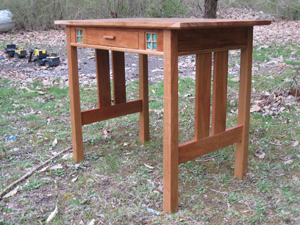 Arts and crafts influence shows in this desk/table. 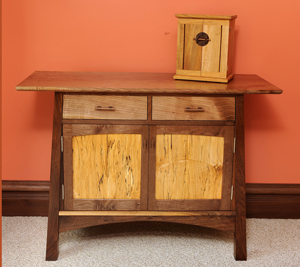 The split apron and floating top lightens the overall look and the natural walnut side panels bring out a more rustic character. 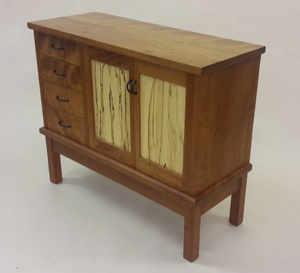 The piece shown is cherry with a maple top and walnut accents. 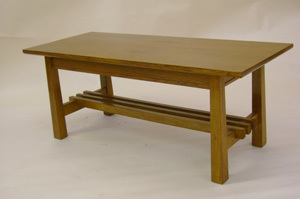 trestle base with a slab top. 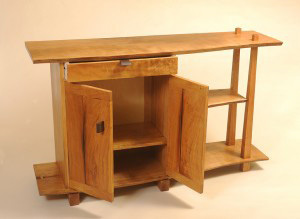 live edge top with small cabinet. 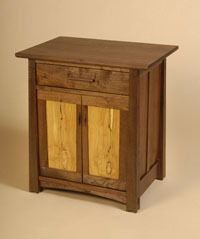 This cabinet can have a single door, double doors or lower portion can be left open. 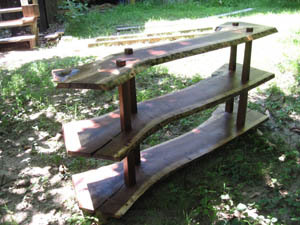 Consecutive live edge slabs used to create shelf tiers. 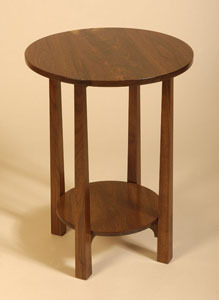 Solid slab uprights provide a sturdy base for the slab top. 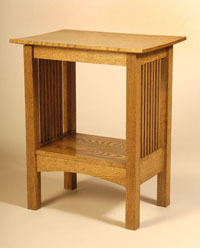 the base can be square, flared, or tapered. 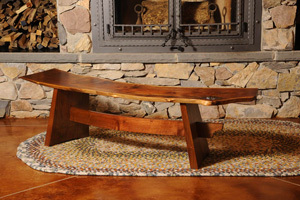 Contemporary mission style coffee table. Features taper legs and beaded apron detail. 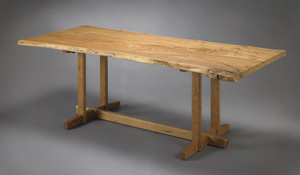 A more contemporary table with roots in the arts and crafts styling. Table features inverse tapered legs for a visually lighter feel. 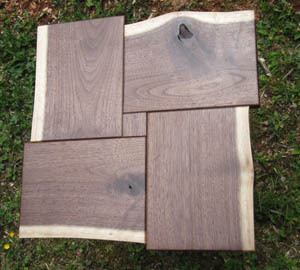 The table can be done in a variety of different wood options. Click on image to see larger version. contemporary mission styling. 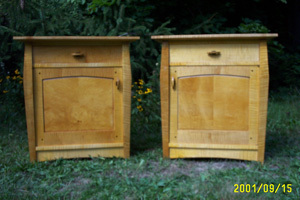 Front of chest opens and slides into upper portion of cabinet. 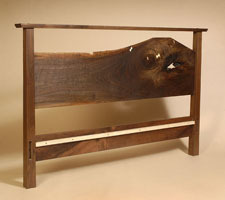 Mission styling is evident in this rustic walnut platform bed frame. 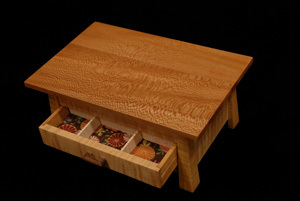 Maple butterflies accent the walnut slab. 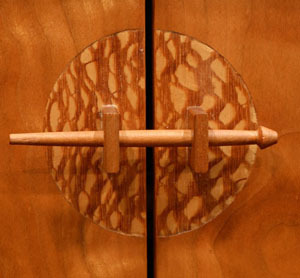 The large crack created a nice focal point for the top of this contemporary cabinet, shown in cherry with spalted maple panels and walnut butterflies. 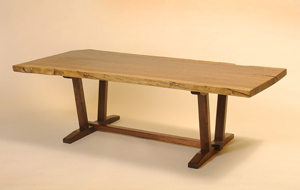 Slab top Hackberry and black walnut coffee table with trestle base. 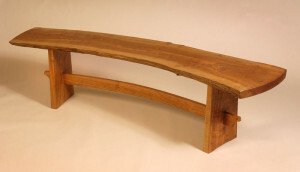 Designed with the torii gates of Japan in mind this bench takes advantage of the natural curve of this cherry log. 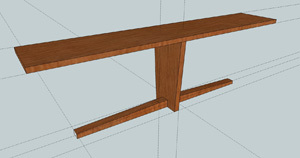 Lower stretcher is laminated from four consecutively cut pieces. 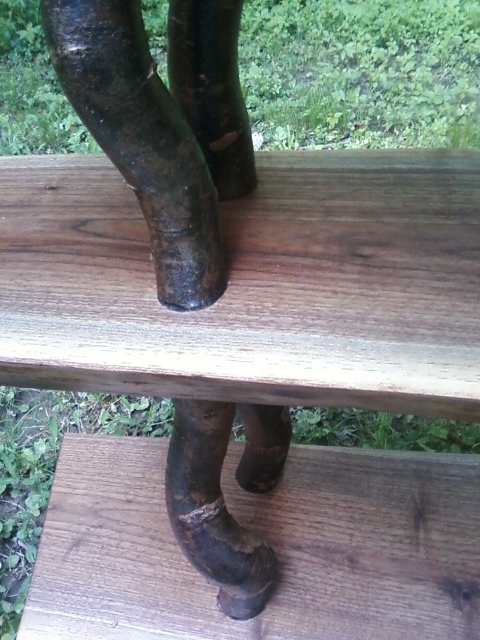 Slab legs are tapered in thickness to futher refine this rustic bench.